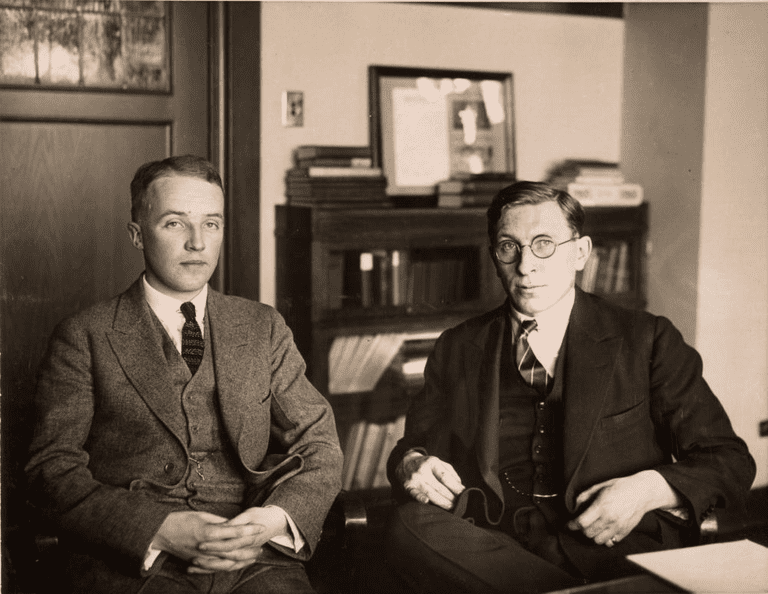 Co-Discoverers of insulin Frank Grant Banting (right) and Charles H. Best, ca. 1924. The experiment that led to the initial discovery of insulin—the hormone manufactured in the pancreas that regulates the amount of glucose in the blood—almost didn’t happen. For years scientists have suspected that the secret to controlling elevated levels of glucose lay in the inner reaches of the pancreas. And when, in 1920, a Canadian surgeon named Frederick Banting approached the head of the University of Toronto’s physiology department with an idea about finding that secret, he was initially rebuffed. Banting suspected a mysterious hormone was being produced in a section of the pancreas called the islets of Langerhans. He theorized that the hormone was getting destroyed by the pancreas’ digestive juices. If he could shut down the pancreas but keep the islets of Langerhans working, he might find the missing substance. Fortunately, Banting’s persuasive powers prevailed and department head John McLeod gave him lab space, 10 Langerhans hormone before it could be isolated. If he could stop the pancreas from working, but keep the islets of Langerhans going, he should be able to find the stuff! experimental dogs, and a medical student assistant named Charles Best. By August of 1921, Banting and Best succeeded in extracting hormones from the islets of Langerhans—which they called insulin after the Latin word for island. When they injected the insulin into dogs with high blood sugar levels, those levels dropped quickly. With McLeod now taking an interest, the men worked quickly to duplicate the results and then set about running a test on a human subject, 14-year-old Leonard Thompson, who saw his blood sugar levels lower and his urine cleared of sugars. The team published there findings in 1923 and Banting and McLeod were awarded the Nobel Prize for Medicine (Banting shared his award money with Best). On June 3, 1934, Banting was knighted for his medical discovery. He was killed in an air crash in 1941.